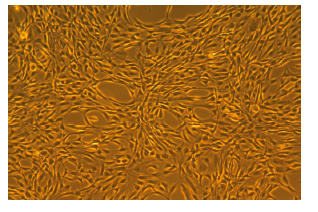 StemLife MSC Medium is optimized for the culture of Human Mesenchymal Stem Cells isolated from Wharton’s Jelly or Adult tissues. StemLife MSC supports the undifferentiated expansion of Human Mesenchymal Stem Cells. StemLife MSC Basal Medium contains no antimicrobials and no phenol red. 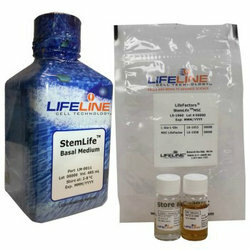 These components are available from Lifeline®, but they are not required for cell proliferation. Kit format for formulation flexibility: StemLife MSC culture medium is offered in a kit format composed of StemLife MSC Basal Medium 500mL, and associated supplements and growth factors in the StemLife MSC LifeFactors® Kit. This kit allows you to prepare fresh medium in your laboratory, extending shelf life and enhancing performance. Protective packaging: StemLife MSC Basal Medium is provided in a light-protected 500 mL bottle. The remaining LifeFactors®are packaged in a convenient gas-impermeable pouch for easy storage. StemLife MSC Medium grows Human Mesenchymal Stem Cells -Wharton’s-Jelly or -Adult, while maintaining an undifferentiated state. Mesenchymal Stem Cells can then be differentiated as seen below. Shown at left: Lifeline® Human Mesenchymal Stem Cells -Adult, passage 4, 4 days after inoculation with ~4,500 cells/cm2 (100X). Shown below, from left to right: Lifeline® Human Mesenchyma Stem Cells -Adult differentiated to adipocytes (stained with Oil Red O, 100X), chondrocytes (sliced and stained with Alcian blue, 400X), and osteoblasts (stained with Alizarin Red S, 100X). Every production lot of StemLife MSC culture medium is extensively tested using Mesenchymal Stem Cells. StemLife MSC Medium and Gentamicin-Amphotericin B are cell culture tested separately.